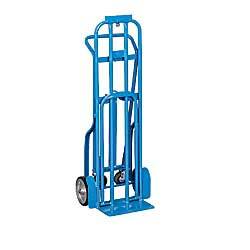 Easily converts from hand truck to tilt truck to platform truck. 1" dia. steel tube frame. 8"H wheelsMR - mold-on rubber, SR - solid rubber, PN - full pneumatic. 1-year warranty. FACTORY QUICK SHIPFOB UTAH. XA-0283 Mold-on Rubber	 19x50"	 62	 MR	 8" x 1-5/8"	 800	 800	 8"	 14x7"	 50"
XA-0284 Solid Rubber	 19x50"	 62	 SR	 8" x 2-1/2"	 800	 800	 8"	 14x7"	 50"
XA-0285 Full Pneumatic	 19x50"	 62	 PN	 8" x 2-1/2"	 800	 800	 8"	 14x7"	 50"